In a darkened space, a down-stuffed duvet is suspended from the ceiling by a rope. The rope is attached to a slowly rotating motor, the sound of which is amplified and creates a monotonous sonic atmosphere. 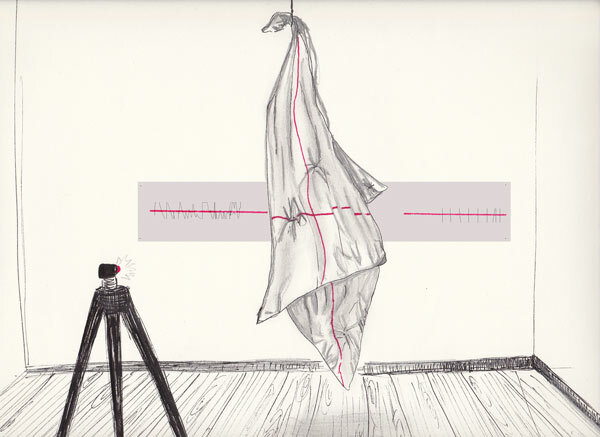 A laser level, mounted on a topographic tripod, projects two perpendicular red lines that are being distorted on the crumpled surface of the rotating duvet. The projection of the horizontal line extends to the wall behind, and the length of its two fragments varies according to the moving shadow of the duvet. A measurement scale on the wall facilitates the reading of the beam's variations.